Background: It is estimated that in Brazil 59,700 new cases of breast and 68,220 new cases of prostate cancer will occur, in 2018, in Brazil. For that reason, there is a need for introducing new antitumor drugs in therapy. Objective: The objective of the study is to bioguide fractionate the organic/aqueous extracts from the aerial organs of Picrolemma sprucei (EB1151 and EB1152) aiming the identification of antitumor compounds and to evaluate the influence of EB1151 on mice behavioral phenotype. 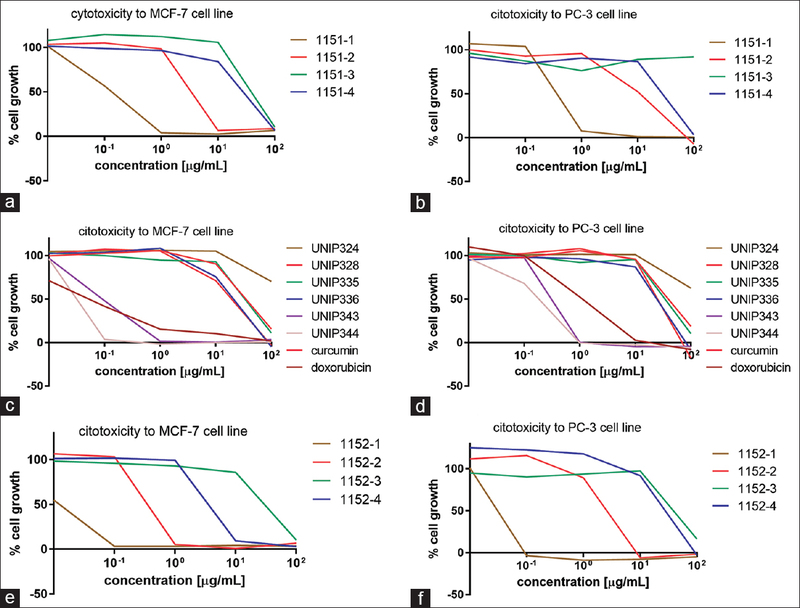 Materials and Methods: The breast (MCF-7) and prostate (PC-3) cancer cell lines cytotoxicity assay were assessed using the sulforhodamine B method. Fractionation was carried out by thin layer and column chromatographic techniques. The influence of the intraperitoneal administration of nonlethal dose (NLD, 39.1 mg/kg) of EB1151 to Balb-c male mice was assessed in open cage and open-field (OF) apparatuses. Results: FCHCl3partition phases from EB1151 and EB1152 showed cytotoxic activity against both cancer cells, as did fractions UNIP343, which contains sergeolide and isobruceine B, and UNIP344, which contains sergeolide and 15-deacetylsergeolide. 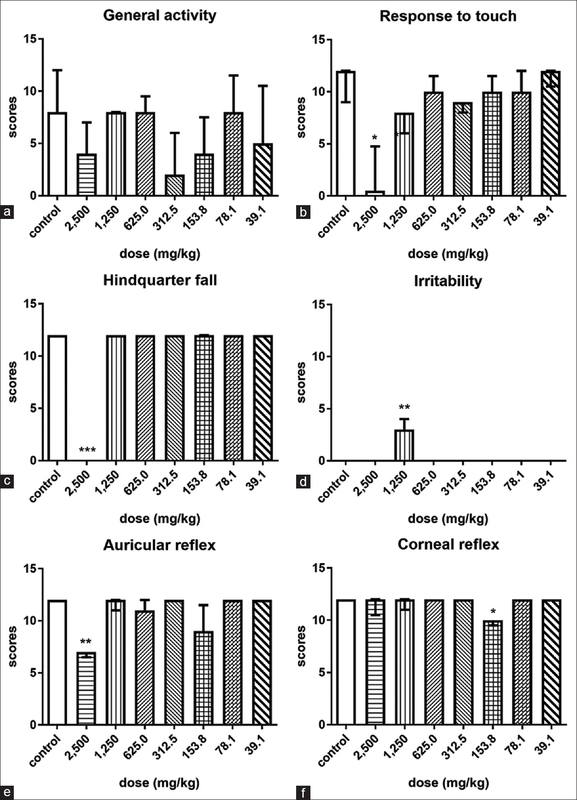 Higher doses of EB1151 showed significant alterations in response to touch, hindquarter fall, irritability, auricular and corneal reflexes, ataxia, micturition, ptosis, piloerection, hypothermia, and cyanosis, and NLD showed alterations in general activity and response to touch, but recovery was obtained up to the end of the experiment. Conclusions: Quassinosides from the aerial organs of P. sprucei showed significant cytotoxicity against MCF-7 and PC-3 cell lines. Extract EB1151 has impaired general activity and activity in the OF apparatus, but recovery was observed. Abbreviations used: IBAMA/CGen/MMA: Instituto Brasileiro do Meio Ambiente e dos Recursos Naturais Renováveis/Conselho de Gestão do Patrimônio Genético/Ministério do Meio Ambiente; UNIP: Universidade Paulista; g: Gram; h: Hour; mL: Milliliters; FCHCl3: Fraction chloroform; FBuOH: Fraction butanol; FH2O: Fraction water; FHEX: Fraction hexane; FDCM: Fraction dichloromethane; FMeOH: Fraction methanol; FACN15: Fraction acetonitrile 15%; FACN50: Fraction acetonitrile 50%; FAcEt: Fraction ethyl acetate; CDCl3: Deuterated chloroform; NH4OH: Amonium hydroxide; DOXO: Doxorubicin; M: Molar; TCA: Trichloroacetic acid; μg: Microgram; IC50: 50% inhibitory concentration; CEUA/ICS/UNIP: Comissão de Ética no Uso de Animais/Instituto de Ciências da Saúde/Universidade Paulista; kg: cm3: Cubic centimeters; Kilogram; BP: Behavioral phenotype; OF: Open-field apparatus; NLD: Nonlethal dose; mL: Microliters; ANOVA: Analysis of variance; FAkl: Fraction alkaloids; mM: Millimolar; DNA: Desoxyribonucleic acid. Organic extract of P. sprucei impaired phetotype behavior of Balb-c male mice, but recovery was observed by the end of the experiment. Compounds that were identified in EB1151 are shown in [Figure 1]. Sitosterol and stigmasterol were identified in the fraction UNIP324. H1 NMR (in CDCl3) shows signs that are characteristic related to steroid skeleton as the double-double-double-doublet at J = 9.5, 4.8, 11.2, and 4.6 Hz, attributed to H-3 and a large singlet at δ 5.36 which indicates the presence of an olefinic hydrogen (H-6), also shows the double-doublets at δ 5.16 and 5.02, characteristic of stigmasterol (H-23 and H-22). Chemical shifts can be seen in [Table 1], where the comparison to the literature was done. Compounds (14S, 17S, 20S)-14, 17, 20-trihydroxy-24-malabaricen-3-one and (17R, 20R, 24R)-17, 20, 24, 25-tetrahydroxy-14-malabaricen-3-one were identified from fraction UNIP328. Chemical shifts were obtained: H1 NMR (in CDCl3) shows singlets at δ 0.96–1.25 and at δ 1.6–1.74, corresponding to the methyl. H17, H18, and H21 from the structure are at δ 3.30–3.50. Chemical shifts for C13 are described in [Table 1] and were compared to the literature. Cathin-6-one was identified in fraction UNIP335. [Table 1] shows C13 NMR and CDCl3 chemical shifts for cathin-6-one, compared to the literature. The same molecule was identified in fraction UNIP336. 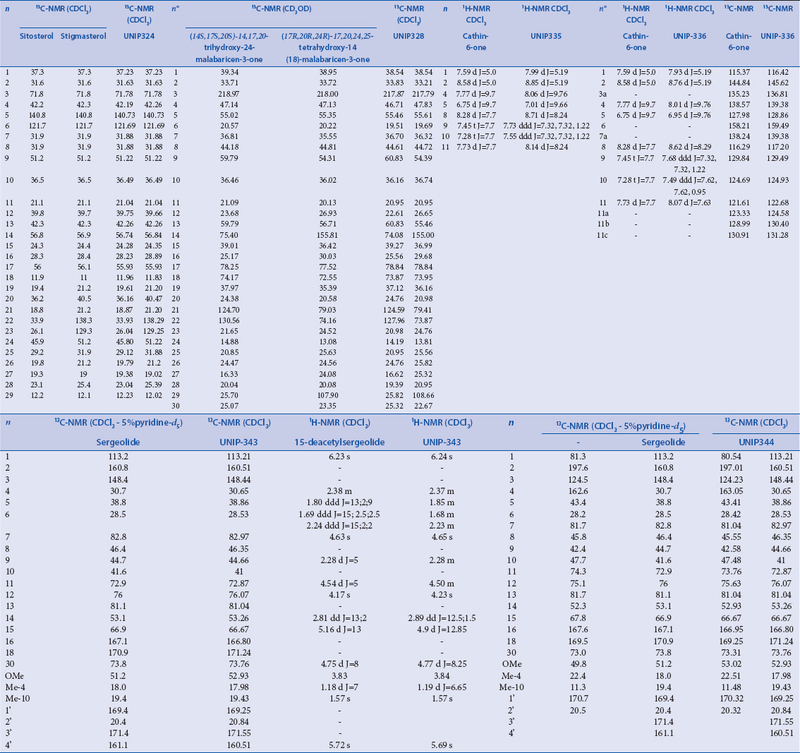 Sergeolide and 15-deacetylsergeolide were identified in fraction UNIP343, and [Table 1] describes chemical shifts obtained for UNIP343 and its comparison to the literature., Isobruceine B and sergeolide were identified in fraction UNIP344, and [Table 1] describes the chemical shifts for C13 NMR, CDCl3, and its comparison to the literature. 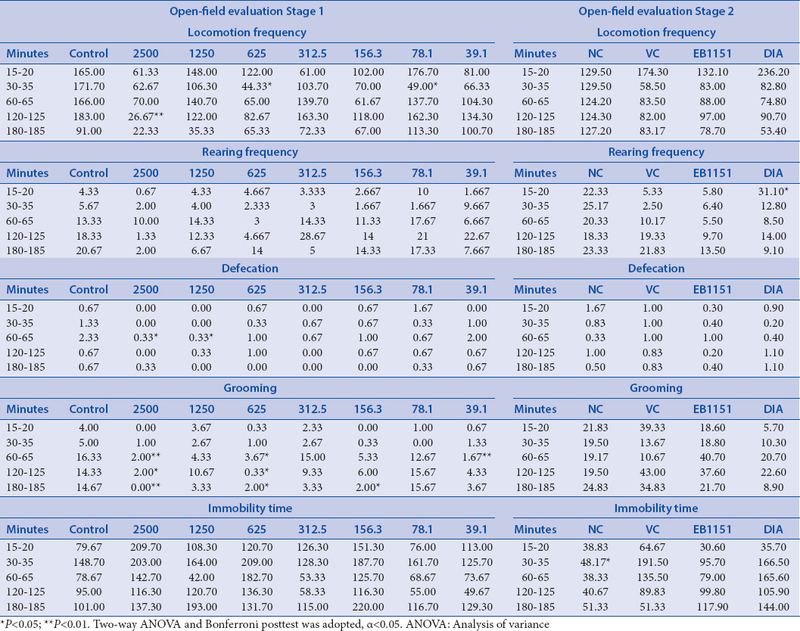 [Table 2] and [Figure 2] show results obtained from cytotoxic assay which show that partition phases FCHCl3 obtained from both EB1151 and EB1152 showed to be more cytotoxic against breast (0.128 μg/mL and 0.011 μg/mL) and prostate (0.388 μg/mL and 0.029 μg/mL) cancer cell lines. Then, fractions FBuOH were subsequently active against breast (3,573 μg/mL and 0.370 μg/mL) and prostate, respectively (9,528 μg/mL and 2.519 μg/mL). Both partition phases FH2O were less active although still significant against breast (42,740 μg/mL and 28.740 μg/mL) and prostate (937.800 μg/mL and 40,580 μg/mL) cancer cell lines. Fraction FAlk from EB1152 was more effective against breast cancer cell line (3,716 μg/mL), in relation to Falk from EB1151 (26.130 μg/mL). Both alkaloidal fractions, from EB1151 and EB1152, showed a similar cytotoxic activity against prostate cancer cell line (25,3800 μg/mL and 28.080 μg/mL). 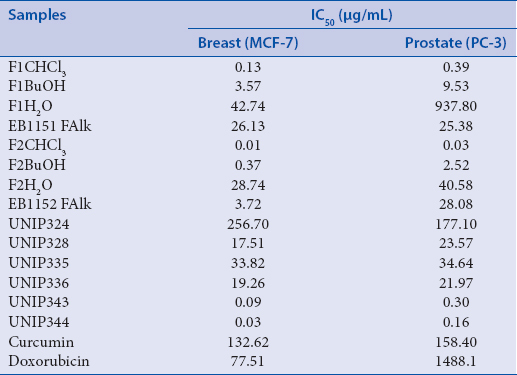 Fractions UNIP343 (breast = 0.093 μg/mL; prostate 0.229 μg/mL) and UNIP344 (breast = 0.031 μg/mL; prostate 0,158 μg/mL), obtained from partition phase FCHCL3, showed to be the most effective against both cancer cell lines, while fraction UNIP324 was not active against the cell lines. Fractions UNIP328, UNIP335, and UNIP336 were also significantly active against the cancer cells, as seen for breast (17.510 μg/mL, 33.820 μg/mL, and 19.260 μg/mL) and prostate (23.570 μg/mL, 34.640 μg/mL, and 21.970 μg/mL) cell lines. The alterations in BP originated from the administration of different doses of extract to three mice each group in the stage one of experiments were analyzed, and the results are statistically described, as shown in [Table 3]. Results related to the influence of the administration of EB1151 over BP in the first stage of the experiment are given [Figure 3]a. The administration of different doses has not significantly influenced the general activity (H~χ20.05, (7) = 7.989; P > 0.05). Diminish in the response to touch [Figure 3]b (H~χ20.05, (7) = 14.64; P < 0.05; after administration of dose 2,500 mg/kg). Hindquarter fall was observed after administration of dose 2,500 mg/kg [Figure 3]c (H~χ20.05, (7) = 34.33; P < 0.01). Irritability appeared [Figure 3]d (H~χ20.05, (7) = 22.11; P < 0.01; after administration of dose 1,250 mg/kg). Auricular reflex [Figure 3]e (H~χ20.05, (7) = 27.00; P < 0.01; diminished after administration of dose 2,500 mg/kg. Corneal reflex [Figure 3]f (H~χ20.05, (7) = 15.35; P < 0.05; diminished after administration of dose 153.8 mg/kg). [Figure 4] shows that ataxia appeared [Figure 4]a (H~χ20.05, (7) = 38.89; P < 0.001) in animals that received dose of 1,250 mg/kg. Micturition was more frequent in animals that received dose of 2.500 mg/kg [Figure 4]b (H~χ20.05,(7) = 25.30; P < 0.01). Ptosis emerged after administration of dose 625.0 mg/kg [Figure 4]c (H~χ20.05, (7) = 30.33; P < 0.01). Piloerection was observed after administration of all tested doses, except 2,500 and 625.0 mg/kg [Figure 4]d (H~χ20.05, (7) = 27.89; P < 0.01). Finally, hypothermia emerged [Figure 4]e (H~χ20.05,(7) = 22.11; P < 0.01) after the administration of dose 153.8 mg/kg, and cyanosis [Figure 4]f (H~χ20.05,(7) = 23.58; P < 0.01) increased after administration of doses 153.8 and 78.1 mg/kg. [Figure 5] shows which parameters were altered in Stage 2 of the experiment, done with the NLD. General activity of animals treated with EB1151 was significantly diminished in relation to control and to the naïve groups [Figure 5]a (H~χ20.05, (8) = 12.97; P < 0.01) and response to touch [Figure 5]b (H~χ20.05, (8) = 11.94; P < 0.01). Inca; 2018. Available from: http://www.inca.gov.br/wps/wcm/connect/agencianoticias/site/home/noticias/2018/inca-estimacerca-600-mil-casos-novos-cancer-para-2018. [Last accessed on 2018 Mar 20]. Suffredini IB, Varella AD, Younes RN. Cytotoxic molecules from natural sources: Tapping the Brazilian biodiversity. Anticancer Agents Med Chem 2006;6:367-75. Suffredini IB, Paciencia ML, Frana SA, Varella AD, Younes RN.In vitro breast cancer cell lethality of Brazilian plant extracts. Pharmazie 2007;62:798-800. Suffredini IB, Paciencia ML, Varella AD, Younes RN.In vitro prostate cancer cell growth inhibition by Brazilian plant extracts. Pharmazie 2006;61:722-4. Suffredini IB, Sader HS, Gonçalves AG, Reis AO, Gales AC, Varella AD, et al. Screening of antibacterial extracts from plants native to the Brazilian Amazon Rain Forest and Atlantic Forest. Braz J Med Biol Res 2004;37:379-84. Ozi JM, Suffredini IB, Paciencia M, Frana SA, Dib LL.In vitro cytotoxic effects of Brazilian plant extracts on squamous cell carcinoma of the oral cavity. Braz Oral Res 2011;25:519-25. Suffredini IB, Paciencia ML, Varella AD, Younes RN.In vitro cytotoxic activity of Brazilian plant extracts against human lung, colon and CNS solid cancers and leukemia. Fitoterapia 2007;78:223-6. Saraiva RC, Barreto AS, Siani AC, Ferreira JL, Araujo RB, Nomura SM, et al. Leaf and stem anatomy of Picrolemma sprucei Hook (Simaroubaceae). Acta Amazon 2003;33:213-20. Duke JA, Vasquez R. Amazonian Ethnobotany Dictionary. Boca Raton: CRC Press; 1994. p. 137. Castilho AL, Saraceni CH, Díaz IE, Paciencia ML, Suffredini IB. New trends in dentistry: Plant extracts against Enterococcus faecalis. The efficacy compared to chlorhexidine. Braz Oral Res 2013;27:109-15.
de Castilho AL, da Silva JP, Saraceni CH, Díaz IE, Paciencia ML, Varella AD, et al. In vitro activity of amazon plant extracts against Enterococcus faecalis. Braz J Microbiol 2014;45:769-79. Estork DM, Gusmão DF, Paciencia ML, Díaz IE, Varella AD, Younes RN, et al. First chemical evaluation and toxicity of Casinga-cheirosa to Balb-c male mice. Molecules 2014;19:3973-87. Monks A, Scudiero D, Skehan P, Shoemaker R, Paull K, Vistica D, et al. Feasibility of a high-flux anticancer drug screen using a diverse panel of cultured human tumor cell lines. J Natl Cancer Inst 1991;83:757-66. Skehan P, Storeng R, Scudiero D, Monks A, McMahon J, Vistica D, et al. New colorimetric cytotoxicity assay for anticancer-drug screening. J Natl Cancer Inst 1990;82:1107-12. Brito AS. Manual of Toxicology Assays. Campinas: Editora da Unicamp; 1994. p. 122. Estork DM, Gusmão DF, Paciencia ML, Frana SA, Díaz IE, Varella AD, et al. 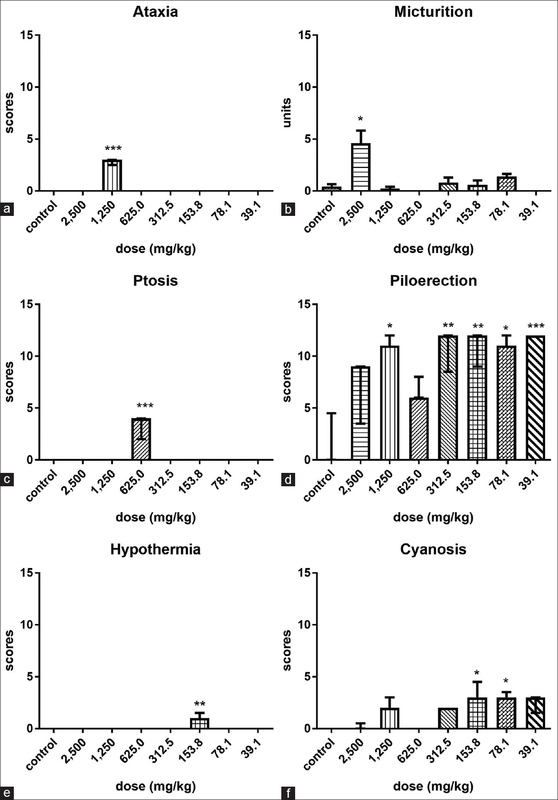 Casinga-Cheirosa organic extract impairment over Balb-c male mice behavioral phenotype. Rev Bras Farmacogn 2016;26:216-24. Gusmão DF, Estork DM, Paciencia ML, Diaz IE, Frana SA, Rodrigues PA, et al. Preliminary evaluation of the acute toxicity related to Abarema auriculata to mice and investigation of cytotoxicity of isolated flavonones. Pharmacologyonline (Salerno) 2013;1:113-27. Gusmão DF, Estork DM, Paciencia ML, Díaz IE, Suffredini IB, Varella AD, et al. Influence of the intraperitoneal administration of antitumor Abarema auriculata extract on mice behavior. Rev Bras Farmacogn 2013;23:903-12. Zar JH. Biostatistical Analysis. 4th ed., Vol. 663. New Jersey: Prantice-Hall Inc.; 1999. p. 212. Pateh UU, Haruna AK, Garba M, Iliya I, Sule IM, Abubakar MS, et al. Isolation of estigmasterol, β-sitosterol and 2-hydroxyhexadecanoic acid methyl ester from the rhizomes of Stylochito n lancifolius pyer and kotchy (Araceae). Niger J Pharm Sci 2009;7:19-25. Achanta PS, Gattu RK, Belvotagi AR, Akkinepally RR, Bobbala RK, Achanta AR, et al. New malabaricane triterpenes from the oleoresin of Ailanthus malabarica. Fitoterapia 2015;100:166-73. 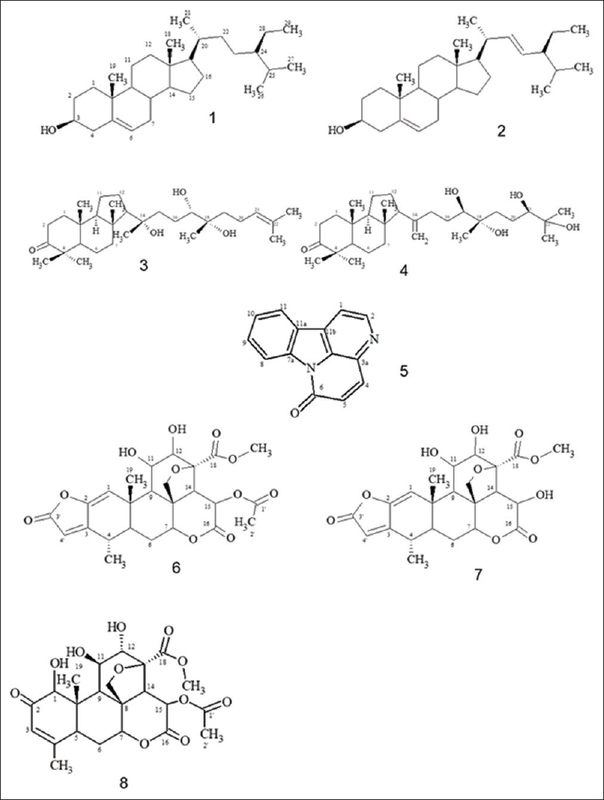 Koike K, Ohmoto T. Carbon-13 nuclear magnetic resonance study of cathin-6-one alkaloids. Chem Pharm Bull 1985;33:5239-44. Moretti CH, Polonsky J, Vuilhorgne M, Prange T. Isolation and structure of sergeolide, a potent cytotoxic quassinoid from Pricolemma pseudocoffea. Tetrahedron Lett 1982;23:647-50. Polonsky J, Bhatnagar S, Moretti C. 15-deacetylsergeolide, a potent antileukemic quassinoid from Picrolemma pseudocoffea. J Nat Prod 1984;47:994-6. Phifer SS, Lee D, Seo EK, Kim NC, Graf TN, Kroll DJ, et al. Alvaradoins E-N, antitumor and cytotoxic anthracenone C-glycosides from the leaves of Alvaradoa haitiensis. J Nat Prod 2007;70:954-61. Rivero-Cruz JF, Lezutekong R, Lobo-Echeverri T, Ito A, Mi Q, Chai HB, et al. Cytotoxic constituents of the twigs of Simarouba glauca collected from a plot in Southern Florida. Phytother Res 2005;19:136-40. Muhammad I, Bedir E, Khan SI, Tekwani BL, Khan IA, Takamatsu S, et al. Anew antimalarial quassinoid from Simaba orinocensis. J Nat Prod 2004;67:772-7. Loizzo MR, Said A, Tundis R, Rashed K, Statti GA, Hufner A, et al. Inhibition of angiotensin converting enzyme (ACE) by flavonoids isolated from ailanthus excelsa (Roxb) (Simaroubaceae). Phytother Res 2007;21:32-6. Tischler M, Cardellina JH 2nd, Boyd MR, Cragg GM. Cytotoxic quassinoids from Cedronia granatensis. J Nat Prod 1992;55:667-71. Silva EC, Amorim RC, Tadei WP, Pohlit AM. Gram-scale isolation of isobrucein and neosergeolide from Picrolemma sprucei Hook.f. Acta Amazon 2009;39:229-32. Silva EC, Cavalcanti BC, Amorim RC, Lucena JF, Quadros DS, Tadei WP, et al. Biological activity of neosergeolide and isobrucein B (and two semi-synthetic derivatives) isolated from the Amazonian medicinal plant picrolemma sprucei (Simaroubaceae). Mem Inst Oswaldo Cruz 2009;104:48-56.
de Andrade-Neto VF, Pohlit AM, Pinto AC, Silva EC, Nogueira KL, Melo MR, et al. In vitro inhibition of Plasmodium falciparum by substances isolated from Amazonian antimalarial plants. Mem Inst Oswaldo Cruz 2007;102:359-65. Cavalcanti BC, da Costa PM, Carvalho AA, Rodrigues FA, Amorim RC, Silva EC, et al. Involvement of intrinsic mitochondrial pathway in neosergeolide-induced apoptosis of human HL-60 Leukemia cells: The role of mitochondrial permeability transition pore and DNA damage. Pharm Biol 2012;50:980-93. Chan KL, Choo CY. The toxicity of some quassinoids from Eurycoma longifolia. Planta Med 2002;68:662-4. Fandeur T, Moretti C, Polonsky J.In vitro and in vivo assessement of the antimalarial activity of sergeolide. Planta Med 1985;51:20-3. Tung MH, Duc HV, Huong TT, Duong NT, Phuong do T, Thao do T, et al. Cytotoxic compounds from Brucea mollis. Sci Pharm 2013;81:819-31.